We’ve been going a little Miracle Noodle crazy in my house these days. These konjac-based noodles are not only low-carb, they have zero calories(!) per serving. 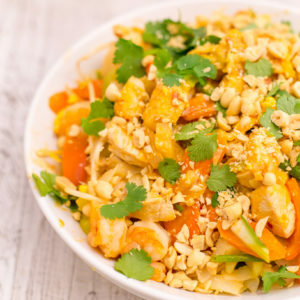 I developed this Pad Thai recipe so that my husband and I could enjoy one of our favorite Thai takeout dishes at home, without the blood sugar spike that comes from eating a sugary, rice noodle-filled plate of the traditionally prepared dish. Thanks to Miracle Noodles, reduced sugar ketchup, and Swerve sweetener, we ended up with a very diabetic-friendly dinner that anyone would enjoy. I’ll admit, it definitely feels strange to be relying on sugar-free, processed, and “substitute”-type foods to get dinner on the table. It’s all about balance, though. 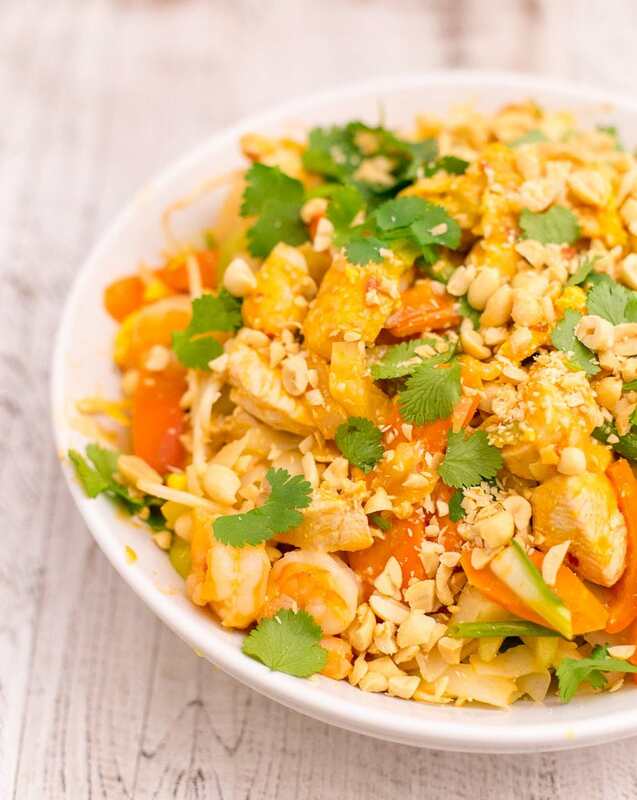 This Pad Thai is absolutely loaded with fresh vegetables and lean proteins, so much so that by the time you’re stirring everything together, it’s hard to keep it all from spilling out of the pan. Use a big, big skillet or sauté pan (12-inches or larger) — you’ll need the extra room! Way lower in carbs than the typical Pad Thai takeout favorite. Mix together the sauce ingredients in a small bowl. Set aside. Drain the Miracle Noodles in a colander for 1 minute under cold running water. In a medium (3-quart) saucepan, boil 8 cups of water. Add the noodles and let boil for 3 minutes. Drain in the colander. Use a kitchen shears to cut the noodles a few times, just to break them up a bit. Heat a large (12-inch) nonstick skillet over medium heat. Add the noodles and stir-fry for 3 minutes, until squeaky and dry. Transfer to a dish and set aside. Return the skillet to the heat. Add the avocado oil and garlic and sauté until the garlic is bubbling and beginning to turn blonde, about 1 minute. Add the shrimp and spread out in a single layer. Let sear for 2 minutes, flip, and let cook for 1 more minute, or until cooked through. Transfer to the dish with the noodles. Add the chicken to the skillet and spread it out in a single layer. Let sear for 4 minutes, flip, and let cook for 4 more minutes, until cooked through. Transfer to the dish with a slotted spoon. There should be some liquid left in the pan. Add the celery, onion, cabbage, bell pepper, and carrot to the skillet and and cover. Let cook, covered, for about 4 minutes. Uncover the skillet, stir the vegetables around and break up the onions, and cover once more, for 1 minute. Uncover the skillet again — the vegetables should be tendercrisp. Transfer the cooked vegetables to the dish with the noodles and proteins. Return the skillet to the heat once more. Add the eggs and scramble for about a minute, until set, breaking them up with a spatula as they cook. When the eggs are cooked through, add back all of the other cooked ingredients from the dish. 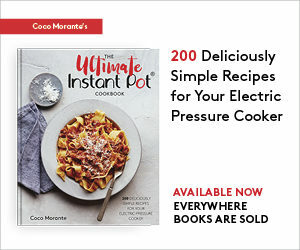 Turn the heat up to medium high. Pour the bowl of sauce over the top and stir to combine, stir-frying for about 3 minutes, until the sauce begins to sizzle in the skillet. Turn off the heat. Add the lime juice, bean sprouts, and green onions and toss to combine. Transfer the pad thai to the serving dish. Top with cilantro and chopped peanuts and serve warm. Vegetarian/Vegan Variation: Substitute coconut aminos for the fish sauce, and 1 block of firm tofu for the shrimp and chicken. Cut the tofu into ½-inch thick slices, press it between paper towels, then cut the slices into bite-sized pieces. 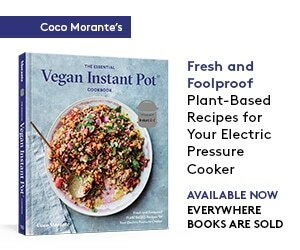 To make the recipe vegan, leave out the eggs.